I can't believe it's already time for Friday's Show Us Your Life post on Kelly's Korner! Yet, here we are. :) This week I get to show you all my gorgeous wedding party and some of the flowers. I chose roses crescendoing in colors to define each bridesmaid and create interest. Then I had all the colors combined in my bouquet. I thought it turned out really well. The pictures don't even give them justice. These are my girls, the b-e-a-utiful bridesmaids. Could they be any hotter?? Starting from the left I will talk about how I know each one. Megan and I met in college and became fast friends. We were in the same major and ended up living together our senior year. Suzanne & I met through our sorority, Pi Phi, and lived together in the sorority house & our senior year. Lindsey & I went to rival high schools and didn't meet until we joined the same sorority. We also lived together in the sorority house and our senior year. Kara (maid of honor) & I have been best friends since my freshman year of high school. We also lived together my senior year. Michelle (the bomb shell red head) & I met through Pi Phi and we were connected at the hip. We lived together in Pi Phi as well. Last but certainly not least, Erin & I met working together at Lafene which was the campus pharmacy. We were the best darn pharmacy techs K-State had ever seen! We also lived together my senior year. You guessed it. I had a LOT of roomies my senior year. It was a blast! These were our groomsmen. I didn't like how the photographer positioned Ryan with them so I chose one with me in it instead. Ryan has some pretty handsome friends if I do say so myself. Not too shabby. ;) Again, I will list them from left to right. First off is Kenneth, we just went to his wedding in New Mexico a couple months ago. You can read about it here. Ryan & Ken were DU brothers together and their mom's were Kappa's together back in the day. Ty was one of Ryan's best buddies in high school. Evan is Ryan's cousin and have always been super close. We visited Even in New York City when he moved there for Ryan's 25th birthday a few years ago. Miles (6 foot 8 inches if you were wondering) is Ryan's best friend & best man. They've know each other since they were little. I feel like I have two body guards with me when I am out with Miles & Ryan. Matt was one of Ryan's best buddies in high school. Finally, Graham and Ryan were DU brothers and lived together their senior year (really fifth year). Their mom's were Kappa's together as well. Small world! Our entire wedding party minus the guest book & gift attendants. I don't know where they were for this picture. Carly & Ashley (on the far left) were our program attendants. You might recognize them from my previous post (they are both preggers). 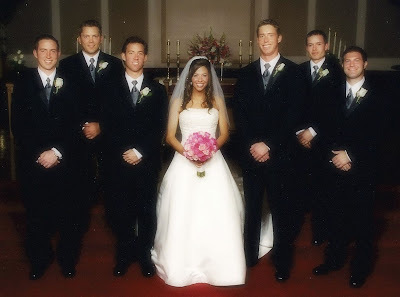 We had 4 ushers (pictured to the very right) Josh, Tony, Jon and Graham (he duoed as both groomsmen & usher). 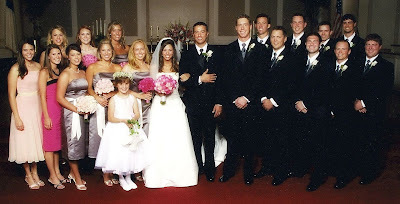 The cutie up front is Abby our adorable flower girl. She was the star of the show. Abby's family is really good friends with Ryan's. It was the best wedding party I could have ever asked for. They made our day so special. That's about it. Hope you enjoyed meeting our fabulous friends. We miss them lots all the way from Texas. You look beautiful! 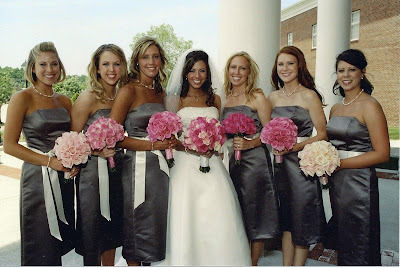 I love your bridesmaids dresses and the roses! What a great idea for the flowers. They were absolutely GORGEOUS! Thanks for sharing...your wedding was beautiful. You are so stinkin' gorgeous!! Seriously, what a beautiful wedding party and I love your flowers! SO pretty, I love the idea for your bouquet! Y'all are such a cute couple! 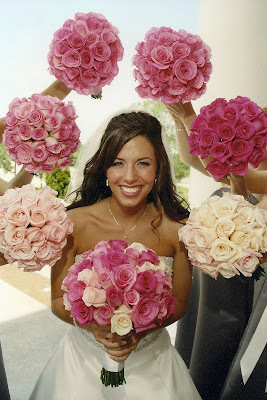 I love that you used all different shades of pink for your bridesmaids bouquets! How absolutely beautiful! You looked gorgeous and your wedding, flowers and party - stunning! Thanks for giving us a peak into your wedding day! Wow, very big wedding party. The maids and grooms all looked great. Very pretty dresses that you picked out for them. Looks like a wonderful day that you will cherish forever. Oh those bouquets were delightful!